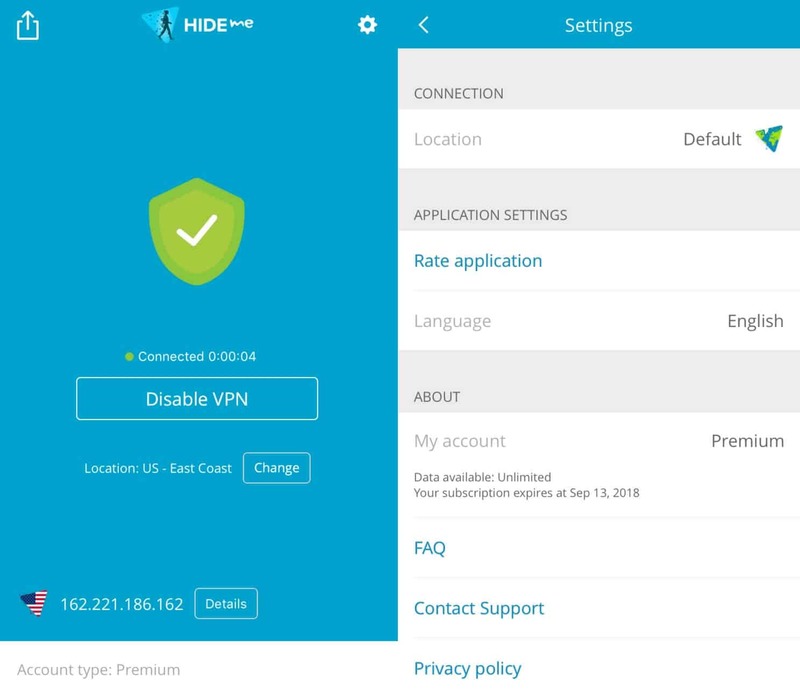 Hide.me Review 2019: A fast, private VPN but does it justify the price tag? This provider fares extremely well when it comes to privacy and boasts some decent speeds. Lack of prompt customer support is disappointing, especially considering its high price. It’s a solid choice for torrenting, but those looking to unblock Netflix should look elsewhere. Hide.me is a Malaysia-based VPN provider that hangs it hat on fast speeds and excellent security. It does come with a pretty hefty price tag in exchange for these offerings. It has a fairly small network of servers but has accrued more than five million users in its six years of operations. While it’s certainly not one of the biggest providers around, this isn’t too shabby. So does the performance of Hide.me warrant its price? Let’s find out! 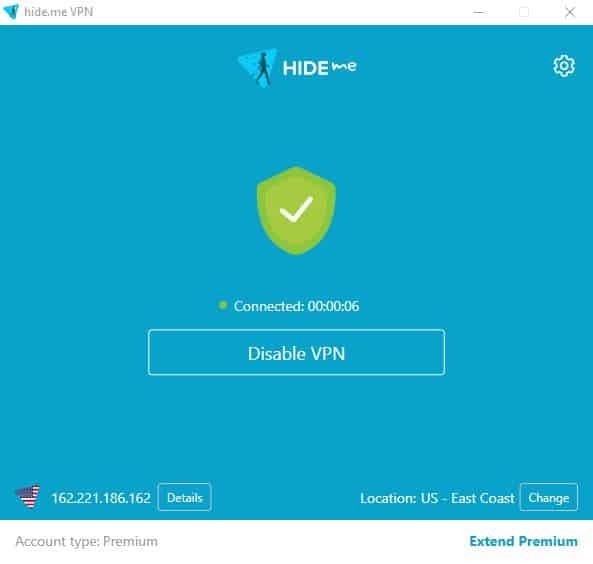 Hide.me offers a free version which is okay for occasional users and is actually ranked as one of our top three free VPNs. However, speed is limited to 3 Mb/s and data transfers to 2GB. This means it’s no good for things like streaming via Kodi or other players, or for torrenting. Moreover, you can only use it on one device and are limited to three server locations (Canada, Netherlands, and Singapore). Moving onto the Plus version, you can still only use one device, but you get 75GB of data transfer and access to all servers. This starts at $4.99 (GBP £3.90) per month for 12 months. This seems surprising because some competitors we’ve reviewed have premium options at lower prices. Speaking of premium options, the Hide.me Premium package is fairly comparable to others in terms of offerings. You can use up to five devices simultaneously and get unlimited data transfer. You also get port forwarding – not available in the other packages – which will mainly appeal to torrenters. If you go for the monthly option, you’re looking at $19.95 (GBP £15.58) per month. As is usual with other VPN providers we’ve reviewed, you’ll get a steep discount if you sign up for a longer term. You’ll pay $13.32 (GBP £10.41) per month if you sign up for six months and $9.99 (GBP £7.80) per month for 12 months. You can pay through credit card, various payment platforms including PayPal and SOFORT, and bitcoin. Overall, Hide.me is very expensive compared to other providers. All paid options do include a 14-day money-back guarantee. This isn’t quite on par with the 30-day guarantee offered by providers like ExpressVPN, but it’s decent all the same. Apps are available for Windows, MacOS, iOS, Android, and Windows Phone. One feature that you don’t see with many VPNs is a full suite of protocols to choose between. This VPN ranks highly in general when it comes to privacy and security with no logs of user activity or IP addresses. It comes with IPv6 and DNS leak protection and a kill switch. The latter acts as a backup in case the VPN connection is lost. For torrenters, servers are marked as to which allow P2P and you can also view their current usage from the website. Adding those features to unlimited bandwidth and decent speeds, this is an ideal VPN for torrenters. Once you’ve selected your plan, getting set up with Hide.me is straightforward. Simply go to the Download VPN tab on the website to download and install the relevant app. For the purposes of this review, we will use the apps for Windows and iOS. The main screen of the desktop app is simplistic, showing your connection time and location, and the current IP address masking yours. Here you can choose which server to connect to by using the Change button in the bottom right-hand corner. The server list shows you which servers are available for P2P (green P2P symbol versus red). Bear in mind you need to disconnect from a server before you choose a new one. In the upper right-hand corner of the screen, you’ll see the gear icon which will take you to your settings. Here you have a this to open up a seven-tabbed screen with a myriad of options. The Information tab simply shows you your plan details. 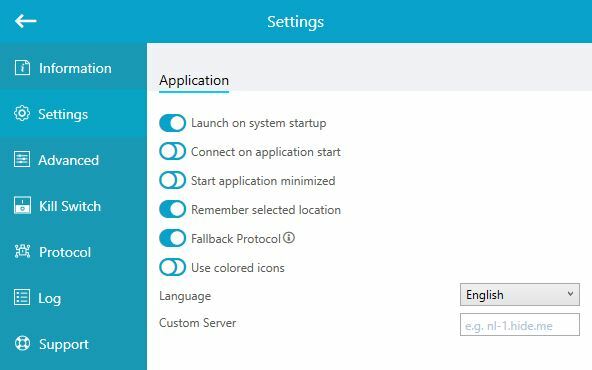 Heading into the Settings tab, you can adjust startup settings, change the language, and add a custom server address. Over in the Advanced screen, you have network settings, including the option to select specific primary and secondary DNS servers. 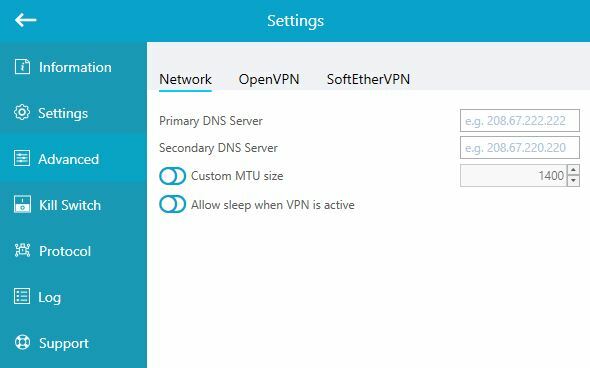 There are also a couple of OpenVPN settings as well as SoftEther VPN settings should you be using that particular protocol. Heading to the Protocol tab, you can easily toggle between protocols. This is especially handy if you’re running into issues while traveling. 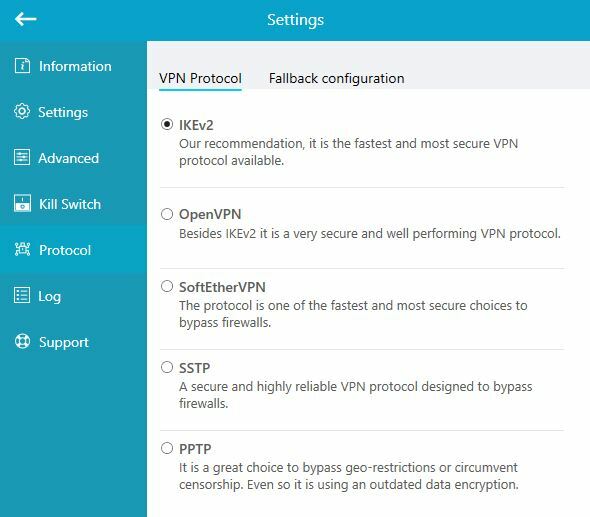 Some VPNs require you to manually set up different protocols (if they’re even available), so being able to try out different ones by simple toggling is a big convenience. The Log tab provides a log of VPN activity and the Support tab will give you the option to send a ticket. The mobile interface has very few features compared to the desktop version. This does make it simple to use and ideal for on-the-go use. While this may be welcome news to beginners, more advanced users may miss some extras. The main screen simply shows whether you’re connected and your current IP address. The app has been recently updated so you no longer have to go into settings to change your location, which is a plus. If you simply click on Enable VPN, the auto server feature will automatically choose the fastest server for your current location. Moving onto the Settings screen, there’s really not a ton to discuss. You can switch server location or change languages. There are 17 languages available whereas most VPN apps are limited to one or two, so this might be a draw for a lot of users. Aside from that, there’s a mobile-specific FAQ page and links to support and privacy pages, among others. According to its website, Hide.me currently has more than 100 servers covering more than 30 countries. This is a very small network compared to larger providers such as ExpressVPN with over 1,500 servers. One nice feature about the server list is it gives you tips on which servers to choose for which purposes. It also tells you which servers are available for P2P, similar to the list within the desktop app. Overall, even with the small network of servers, our experience was pretty good. We streamed 1080p video with no buffering while connected to servers in New York, Los Angeles, and London. We also played online games using the same servers with no issues. When we’ve tested Hide.me in the past, we’ve experienced issues making an initial connection. The wasn’t the case this time around, so things seem to have improved on that front. When we tested Hide.me speeds in the past, it performed very well, but with our new set of tests, it seems to be sitting around the middle of the pack. We aim to make our speed tests as empirical as possible. We use a test server in Canada and connect to various test servers for each provider in the UK, the US, Hong Kong, Germany, and Australia). For each test server, we download a 50MB test file from a US server at six-hour intervals (four times per day). We note the average download speed for each test and display the aggregate data in the below chart. In the first Simple tab, you can see how Hide.me compares to competing VPN providers, solely on the basis of median download speed. Indeed, it sits in the middle with some decent — but not great — speeds. A more detailed version of the results can be found by switching to the Detailed tab. The spread in results for Hide.me is quite tight and there doesn’t appear to be any anomalous readings. This means that you can count on speeds remaining fairly constant. Unfortunately, Hide.me did not unblock Netflix using any of the servers we tested (US East, US West, and London, UK). This is an ongoing struggle for many VPNs as streaming sites like Netflix crack down. Once they detect an IP address is actually one from a VPN provider, they’ll block usage and deliver an error message. If this is a deal-breaker for you, then you’ll need to look elsewhere. We were unable to unblock BBC iPlayer using a UK server and had no luck with Amazon Prime Video. Enabling access to popular streaming sites doesn’t appear to be a priority for this provider. Does Hide.me work in China? Since the Hide.me website has been blocked, if you’re planning to connect while travelling to China, make sure you have all your apps downloaded before you go. As mentioned, Hide.me is based in Malaysia which means it isn’t subject to western data retention laws. It doesn’t store any logs, so you can be sure that there’ll be no records of your browsing history. This has been corroborated by independent security analysts as a show of complete transparency. To sign up, you’ll need to provide an email address and password. When it comes to data security, Hide.me uses 256-bit encryption which is considered pretty much as strong as you can get. This is in conjunction with 8,192-bit RSA keys. This might sound a little excessive (2,048-bit is pretty standard and considered highly effective) but isn’t a bad thing for security. Perfect forward secrecy is provided to ensure session keys can’t be compromised. You have multiple encryption protocols to choose from including PPTP, L2TP/IPSec, OpenVPN, and IKEv2. As mentioned, you can toggle between these within the Protocol screen of the desktop client. There is a kill switch in the desktop client, but just bear in mind that it’s not enabled by default. Once enabled, this acts a privacy backup so that, if the VPN connection drops, internet traffic will be blocked. Hide.me also protects against IP leaks, IPv6 leaks, and DNS leaks. It uses its own non-logging DNS servers, so there’s no worries about Google or another public DNS server provider tracking your activities. The customer support page offers a few options. The first two are Support Ticket (for opening a support request) and Live Chat (for billing and sales questions). The latter is misleading as each time we visited the page, these options both sent us to the same email form. We sent a support request at around 10am ET and it was responded to about three hours later. This is pretty quick for a ticket response, but it’s not live chat. This is surprising since Hide.me is using Zendesk for support. While this should offer reliable around-the-clock support, it is always nicer to have the privacy of in-house support. However, in this case, it seems we’re getting the worst of both sides. The other option on this page is to join the Hide.me community. Here, you’ll find help forums in English or German that cover many of the questions you might have. Within the community, a VPN Tutorials tab contains various tutorials for different operating system and protocol setups, among others. Finally, there is a limited set of FAQs, but your best bet would probably be to check in forums or hope the “live chat” doesn’t take too long. One of the first things that stands out about Hide.me is its high price tag. In theory, this could be justified by its fast speeds, which are decent but nothing spectacular. Other than its main sell point of speed, it’s also extremely secure, and is willing to prove it. For the more privacy-conscious user, this might be enough to swing it. This provider is a great option for torrenters and includes features geared towards this corner of the market. These include unlimited data transfer, port forwarding, decent speeds, and P2P server lists. The major mark against Hide.me lie in its inability to unblock popular streaming services like Netflix and Amazon Prime Video. It’s also missing prompt support, which you’d expect to get given the high price of the service. We’d recommend careful evaluation during the 14-day money-back guarantee period if you’re signing up for a paid package.